The trend in the past year of iPad usage is slowly moving towards using the iPad as a creation device, as opposed to just a consumption device. More and more people I know are creating great material with iPads. Outside of the education spectrum, however, I still know a lot of people who just use their iPads for surfing websites, checking email, and playing games. I bumped into an old friend that I had not seen in years, and noticed he had the latest Blackberry smartphone, the z10. I asked him how he liked it, and how it compared to an iPhone. He told me that he also had an iPhone and an iPad, but that he only does “real work” on his Blackberry. The stigma is still there. Will it be there another year from now? 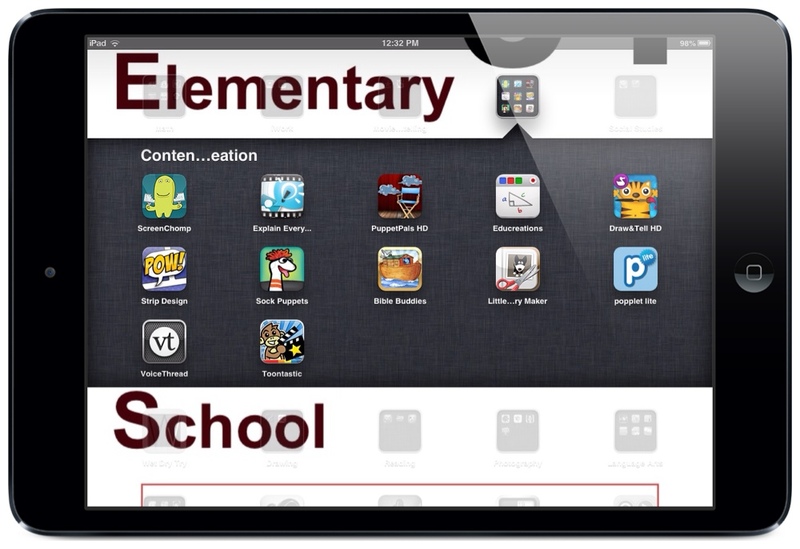 This is a screenshot of the content-creation apps folder for our class set of iPads. As a staff, we had a chance to discover with some of these apps and what they could do. In just ten minutes, groups were able to create short examples presentations using these apps. They then had a chance to share how they could use that app in their classrooms. Our goal as iPad teachers is to rely less on content-specific apps and further our knowledge in using creation apps to make valuable lessons for our students. Have you used many of these apps? Do you have more content creation apps that you could suggest? Are there any apps that you use to create great material that you want to share? Please let us know in the comments! Next Post Copy.com – 20 GB Free Cloud Storage! Creation apps are perfect for making fun experiences with other languages! The “Sunny Earth” kids love Sock Puppets and PuppetPals. We have also used Explain Everything and Voicethread. We will be checking out the other apps mentioned in this blog for sure!